This is one of my favorite things to serve for a special dinner. It does take a bit of time to put together. However, it’s totally worth it! First, I prepared a dry rub for the pork consisting of Kosher salt, dried thyme, freshly ground black pepper, and minced garlic. After I had trimmed the tenderloin, I patted it dry, and rubbed the dry rub over all sides. Then, I placed the seasoned pork in a ziploc bag and refrigerated it for several hours. Next, I prepared the mushroom stuffing, which was really like Duxelles. 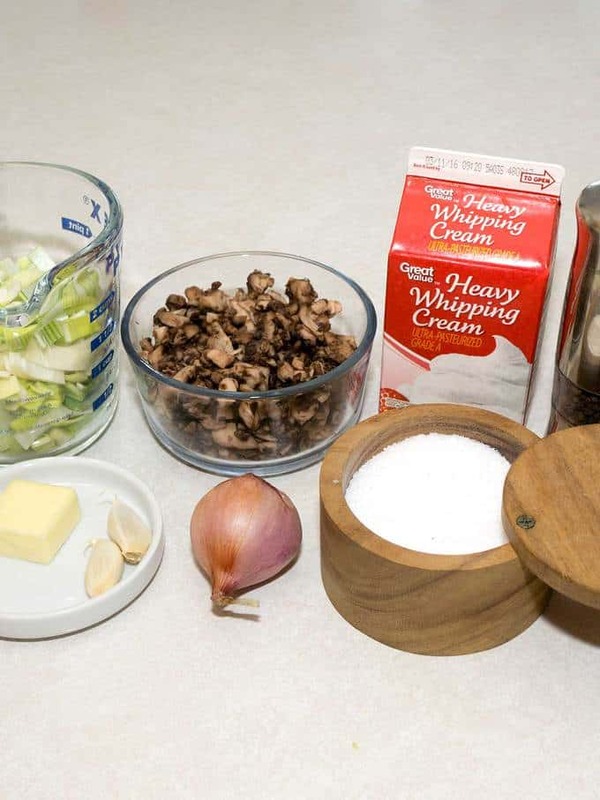 I used the following ingredients: Unsalted butter, mushrooms, shallots, leeks, minced garlic, heavy cream, salt, and freshly ground black pepper. I started by finely chopping the mushrooms and squeezing as much liquid as possible from the mushrooms. First, I squeezed them in my hands, and then in paper towels. Next, I melted the butter in large skillet over medium-high heat. Then, I added the shallots and sautéed them for about a minute until they were translucent. I added the leeks and mushrooms, and sautéed them for about 6 minutes until they were tender. Next I added the minced garlic, and sautéed it for about 30 seconds until fragrant. I stirred in the cream and cooked the mixture for about 5 more minutes until vegetables were soft and most of the cream was absorbed. Finally, I seasoned the mixture to taste with salt and freshly ground pepper. After the mushroom mixture had cooled, I turned my attention to the pork which I had removed from the refrigerator. I rinsed it well to remove the dry rub, and patted dry with paper towels. Then, I carefully butterflied the tenderloin with a sharp knife. I took care not to entirely cut it in half. Next, I placed it between two pieces of plastic wrap and pounded it to a thickness of about 1/4-inch. I spread part of the mushroom mixture on the tenderloin to within 1-inch of all sides. I reserved the rest of the mushroom mixture for the sauce. 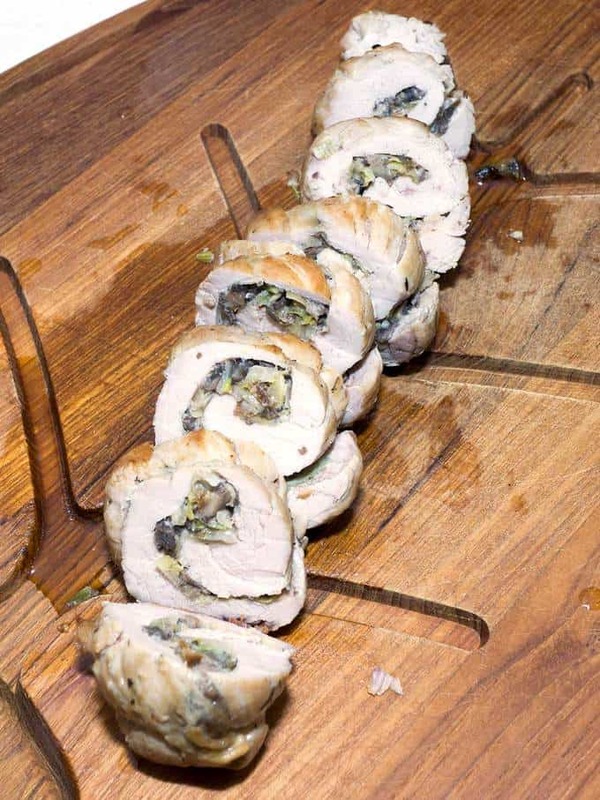 Then, rolled the tenderloin up jellyroll fashion, starting on a long side. Finally, I tied it with cooking twine placed about 1-1/2inches apart. To cook the pork, I started by browning it in a little olive oil in an ovenproof skillet over medium high heat. After the tenderloin was browned on all sides, I placed the skillet into a 350° F oven until the pork reached an internal temperature of 170° F. This took about 20 minutes. I removed the pork from the oven, placed it on a cutting board and tented it with aluminum foil. While the pork was cooking, I focused on the Madeira Cream Sauce. I added chicken broth and Madeira to a small saucepan and boiled the mixture over medium high heat until it had reduced to about 1 cup. This took about 20 minutes. To finish the sauce, I returned the skillet to stove over medium heat, added the flour and stirred it until smooth. I let the flour cook for several minutes until it was lightly browned. Then, I added the reduced broth/Madeira sauce and remaining mushroom mixture. I brought the sauce to a boil to allow it to thicken, scraping up any browned bits. Finally, I added the cream. 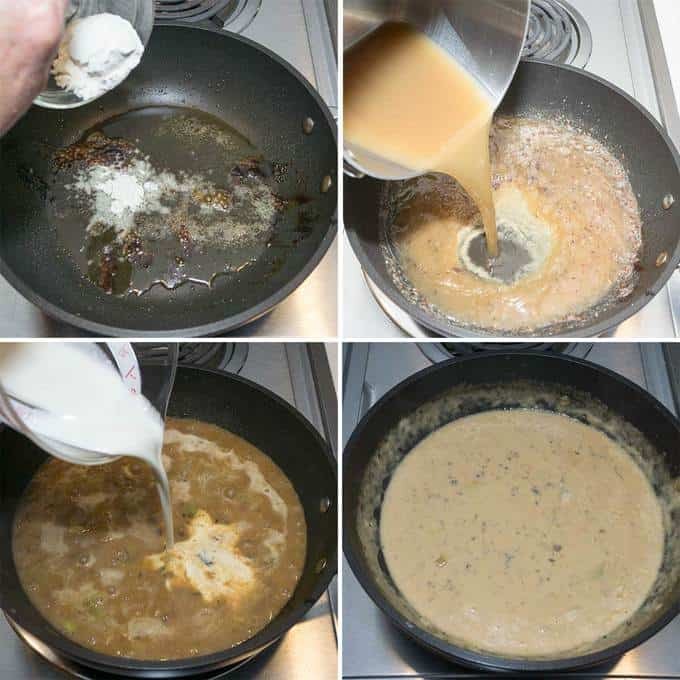 After another few minutes, the Madeira cream sauce was ready. Finally, it was time to eat! I removed the cooking twine from the pork tenderloin. Then, I sliced the tenderloin into 1-1/2 inch slices. 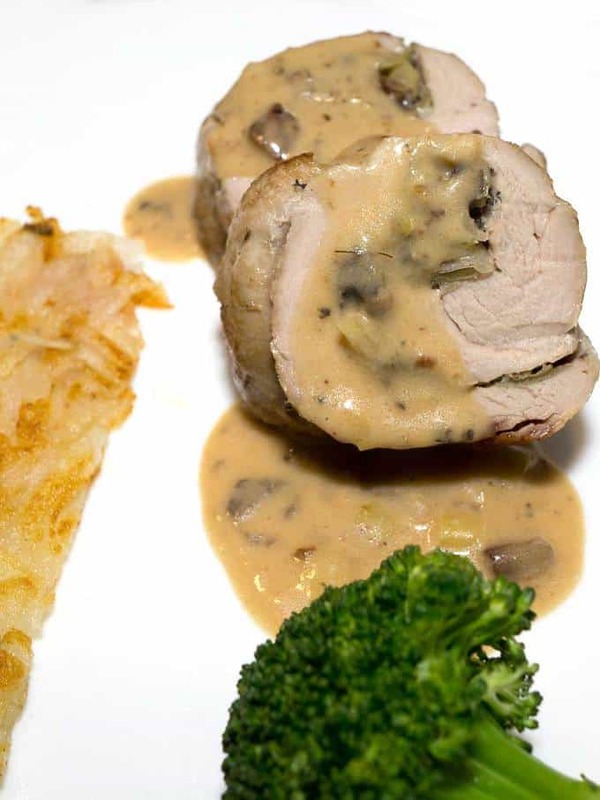 I drizzled the sauce on the pork, and served it with a crisp potato galette and steamed fresh broccoli. I won’t lie – this was pretty labor intensive. However, it was well worth the effort. The pork was fork tender and perfectly seasoned. The mushroom stuffing was out of this world, and the sauce beyond compare. What an elegant meal for Easter or any special occasion. Yum! Mix salt, thyme, pepper and garlic in small bowl.Pat pork tenderloin dry. Rub salt mixture on pork tenderloin.Place in ziploc bag and refrigerate for 3 to 4 hours. Melt 1 Tablespoon butter in large skillet over medium-high heat.Add shallots and sauté until translucent, about 1 minute. 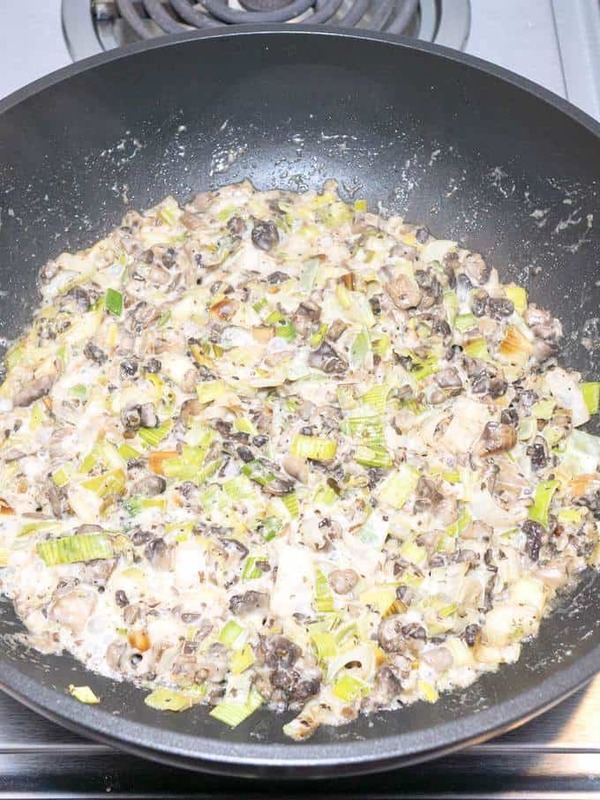 Add mushrooms and leek; sauté until tender, about 6 minutes. Add garlic and cook for 30 seconds more. Stir in cream.Cook mixture until vegetables are soft and most of the cream is absorbed, about 5 minutes. Season to taste with salt and freshly ground pepper.Cool. 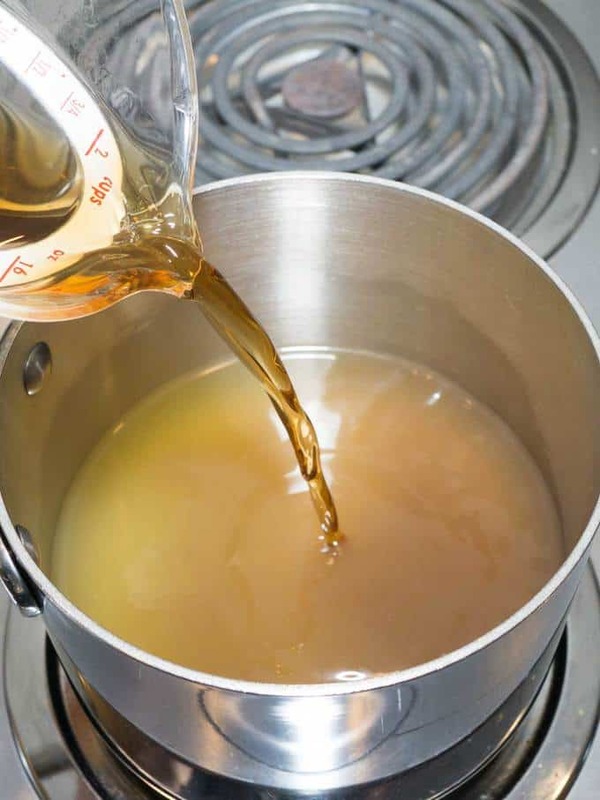 Combine chicken broth and Madeira in heavy small saucepan. Boil until sauce is reduced to 1 cup, about 20 minutes.Set aside. 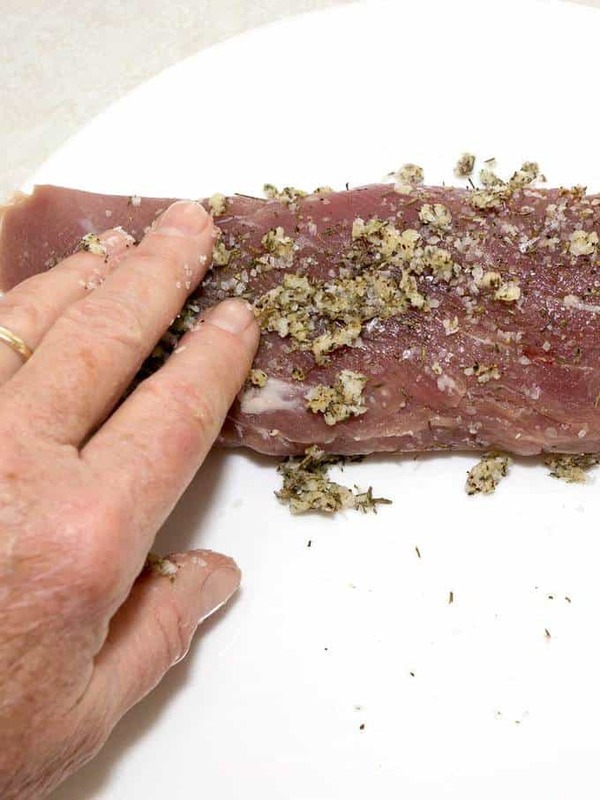 Remove tenderloin from ziploc bag.Rinse well to remove dry rub; dry thoroughly with paper towel. 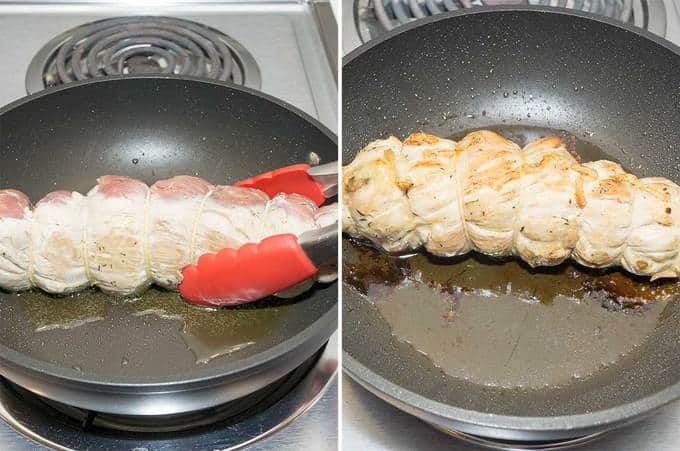 With a sharp knife, butterfly tenderloin, taking care not to entirely cut in half. Place between two pieces of plastic wrap; pound to ¼-inch thick. 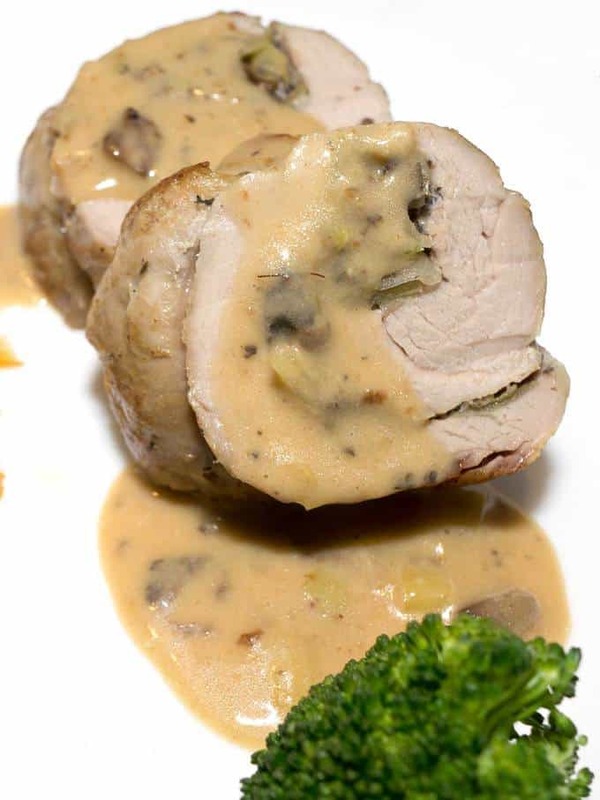 Spread 3/4 cup of mushroom mixture on tenderloin to within 1-inch of all sides. Roll up jellyroll fashion. Tie with cooking twine placed 1 1/2 inches apart. Heat oil in large ovenproof skillet over medium high heat. Add tenderloin to skillet and cook until brown on all sides, about 6 minutes total. Transfer skillet to oven. Roast uncovered until it reaches an internal temperature of 170° F, about 20 minutes. Remove skillet from oven. Transfer tenderloin to cutting board; tent with foil to keep warm. Return skillet to stove over medium heat. Add flour; stir until smooth. Cook for several minutes until flour is lightly browned. Add reduced broth/Madeira sauce, remaining mushroom mixture and cream. Bring to a boil, scraping up any browned bits; cook until thickened. Correct seasonings. 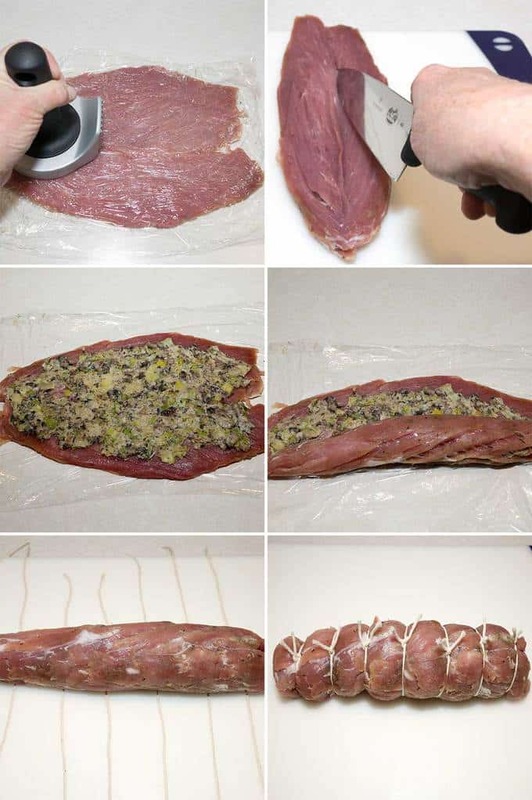 Remove cooking twine from pork tenderloin. Cut tenderloin crosswise into 1 1 1/2 inch slices. Drizzle sauce over pork and serve. Yield: 4 servings. I CAN'T WAIT TO MAKE THIS , IT SOUNDS FANTASTIC!